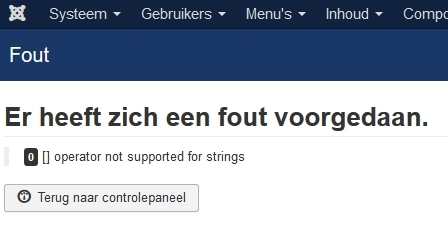 I get the following error message: operator not supported for strings (see screen shot). In the Frontend there is an error (Content coding error) with some categories but not with all. You need update to new version. For every old clients we give 50% discount for every new version of the product. You must have version of component not lower 3.5 to make update. If you have version less 3.5, update for you need do manual, or we will ask money for do it. I will upgrade to version 4. How do I obtain the 50% discount? We replied to you by email.